This is a rush transcript from “Your World,” February 18, 2013. This copy may not be in its final form and may be updated. NEIL CAVUTO, HOST: So, what really is on these protesters’ minds? Well, Marc Morano found out for himself by going into the belly of the beast. And let’s just say this thorn to environmentalists discovered something far more beastly and a lot more scary. MARC MORANO, FORMER U.S. SENATORIAL DIRECTOR OF COMMUNICATIONS: What do you mean you will dismantle the pipeline? UNIDENTIFIED MALE: By we will dismantle the pipeline, we would like for — by any means necessary for this pipeline to not be built. Whether that means strikes by the workers or by any means necessary, we will at least vocally support. MORANO: Well, you sound like — when you say any means necessary, I’m getting images of things getting blown up and eco-terror. Is that what you’re implying? UNIDENTIFIED MALE: No. I’m saying by any means. If we can get it by Barack Obama stopping it, that would be spectacular. MORANO: You’re not endorsing dismantling physically, a violation of the law, or any kind of eco-terrorism, are you? UNIDENTIFIED MALE: It depends on the circumstances. MORANO: Then is it a possibility? UNIDENTIFIED MALE: By any means necessary, we mean by any means necessary. UNIDENTIFIED MALE: We would support it. CAVUTO: All right, Marc is with us now. MORANO: Yeah, this was a very typical sentiment at this rally. There’s anger, and it’s not just — these are not just, oh, these are a few disgruntled protesters. The lead NASA global warming scientist has announced it’s game over for the climate if we approve the Keystone pipeline. James Hansen, he was arrested for the third or fourth time this past week protesting the pipeline. He is — NASA’s lead scientist endorsed a book calling the world for ridding itself of industrial civilization for blowing up dams and razing cities to the ground and turning off our greenhouse gas machine. NASA’s lead global warming scientist was this guy, this particular man I interviewed about eco-terror and the pipeline, his inspiration to stop the pipeline. So, the leaders at NASA, I call him NASA’s resident ex-con, is inspiring these people to potential of eco-terrorism. And they’re against all forms of energy, which doesn’t make sense, because if you have a pipeline, if we’re getting oil from democracy in Canada, let’s call it ethical oil, as opposed to conflict oil, getting it from Nigeria, Venezuela, or the Middle East, it’s a very simple choice where we want to get our oil. The ethical and moral way is to get it from friendly democratic neighbors, not countries with poor human rights records. CAVUTO: Well, you know what is scary, that came out in a lot of these interviews and in the exchange with that one young fellow is that the ends justify the means, and if push came to shove and it meant that tearing this thing down or doing God know’s what, if it meant a world without this oil, it’s a better world for it. That gets to be crazy talk. MORANO: Yes. Yes, and it’s all about — it’s not even about not in my backyard so much, as they’re worried about the extra CO2 that would be emitted in our atmosphere. This is the new — the same guy James Hansen said we only had four years left to save the planet in January 2009. We passed another Mayan calendar deadline. They — these people believe in this doomsday prophecy and don’t think they won’t act. When I was in the U.S. Senate Environment Committee, we had to deal with eco-terrorism when it came to animal rights, we had to deal with — there’s been eco-terrorism when it deals with property rights out in Colorado, so it’s a very real thing. Torching SUVs. 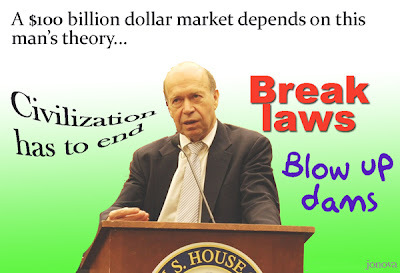 This movement, if it gets frustrated, particularly frustrated with a Democratic president, Obama, who is supposed be their standard bearer and actually goes ahead and approves the pipeline, there are going be a lot of angry people, not the least of which is probably the NASA scientist going to jail again, James Hansen. CAVUTO: Man, oh, man, you’re a brave fellow, Marc, going right into the crowd there, but always good to see you, Marc Morano in Washington.